Moving furniture around is something I find myself doing more than is necessary. It's usually something I start doing at around 10pm and by 1am I'm wishing I hadn't started. It always takes longer than expected. But most of the time I like the change and don't end up moving everything back to where it was before the next day. During this particular shuffle around, my desk has now found a new home (you can see how it looked before here) in front of the window. I don't get to look at my photograph wall anymore but the extra light is brilliant and I can see a little patch of countryside in the distance if I look in between and over the rooftops of surrounding houses. The fields are a mixture of green and golden at the moment and it'll be nice to see them change with the seasons. It's no sea view, but it's not too shabby. Please excuse the creases in the curtains. I just got them and I'm waiting for the creases to drop out by themselves because I'm allergic to ironing. They're fairly weighty so it shouldn't take too long. Good old ikea. They're the Ingert in dark grey and they're only £35, which for curtains I didn't think was too bad. Gosh, that might just be the most boring sentence I've ever typed. I do love a good soft furnishing though. I think that's how you measure when you're becoming a real adult. In addition to holding a plethora of 'things I keep on hand because they might be handy' like stickers, tape and glasses cleaner, Mortimer is my number one desk buddy. He's also rocking a cocktail umbrella because he's always ready to party. Next to him is the crystal goblet I got the last time I went to the Harry Potter Studio Tour. It was ridiculously expensive, but it's proving to be very useful. 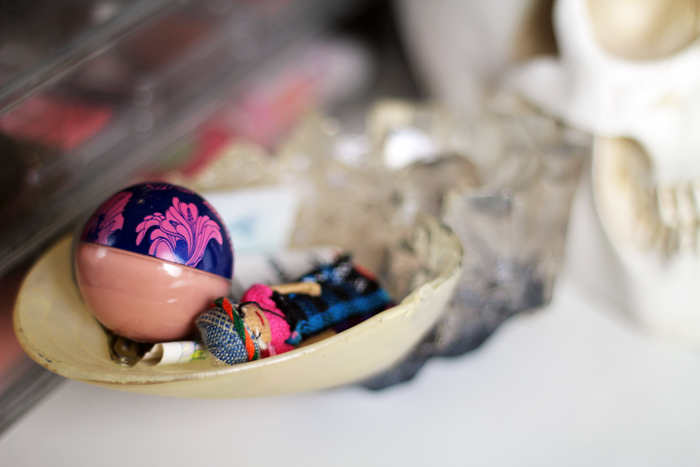 In there I have some hairbands, a £5 note for if I ever fancy nipping over to the shop for emergency snacks at 3 in the afternoon, a tinted lip balm and a little worry doll I've had for years but have no idea where she came from. Similarly a desk is not my desk without a cup of tea. The mug is one I've had since I was very small that I recently uncovered in an box of old things. I hope I don't accidentally break it, but it seemed a shame to put it back in the box where it would sit unused forever. And it's bunnykins. Too cute. The Treacle Moon bath & shower gel is there because I just got it and it smells almost exactly like the smell I smelt the first time a cup of butterbeer was handed to me. Very sweet. Absolutely bloody brilliant! Unequivocally the best shower gel ever. I still have my much loved desk tidy from Rocket St George but it lives on the top of one of my little bookshelves now and if I stretch I still don't even have to leave my seat to reach it so that's a bit of a result. 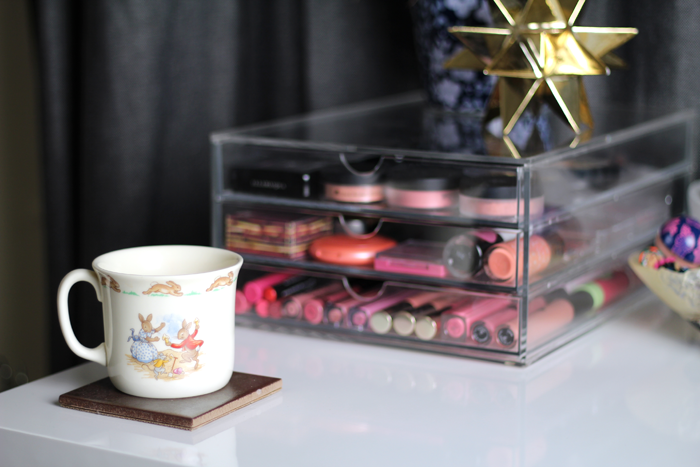 In its place I dug out one of my old acrylic paper sorters that I got from Homebase a long time ago and it houses most of my blushes and lip products. Other than that I just have a couple of plants, one of them looks a bit sad but I'm trying to save him, a monthly calendar that I don't use nearly enough, a butterbeer tankard filled with pens, highlighters and delightfully hideous paperclips with faces, and my trusty desk lamp. Do you have a desk space you like to work from? Oooooh your Muji storage just looks beautiful! Your desk looks so pretty! I love those curtains. LOL I'm allergic to ironing as well. I'm currently in the process of redecorating my living room and there will be what I hope to be a lovely desk space assigned. I can't wait to start planning it. 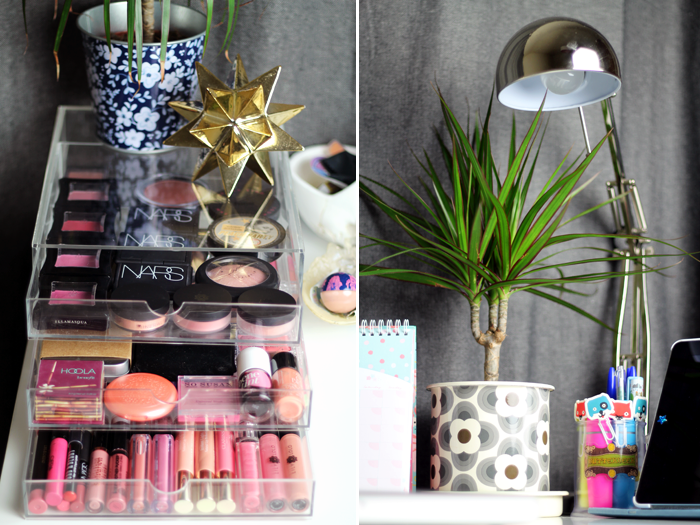 Your desk looks so organised & pretty! I really need to get myself some Muji storage! 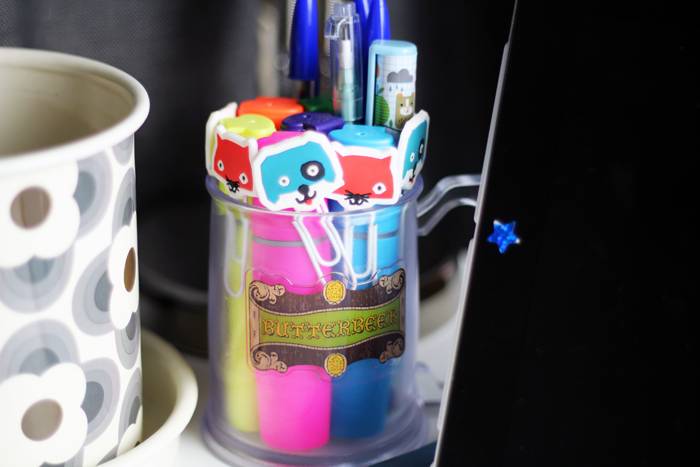 I wish I could keep my desk looking that lovely and tidy for more than five minutes! I usually have to move a ton of paper and magazines before I can even see my desk, let alone work at it haha. I didn't realise how common the allergy to ironing is!! Haha. Life is too short for ironing. 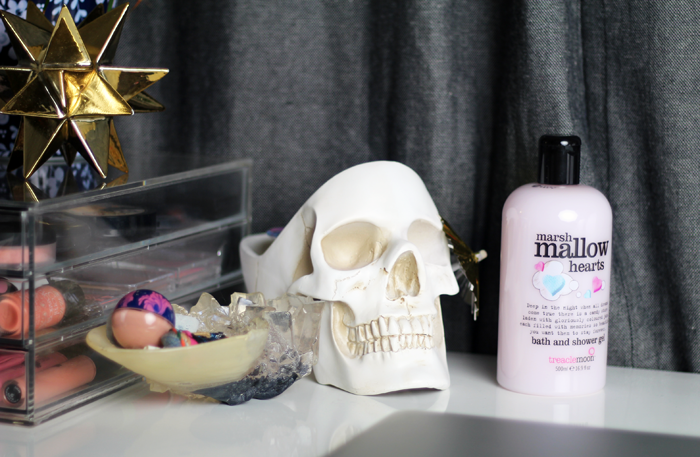 I love everything on your desk, especially the skull! 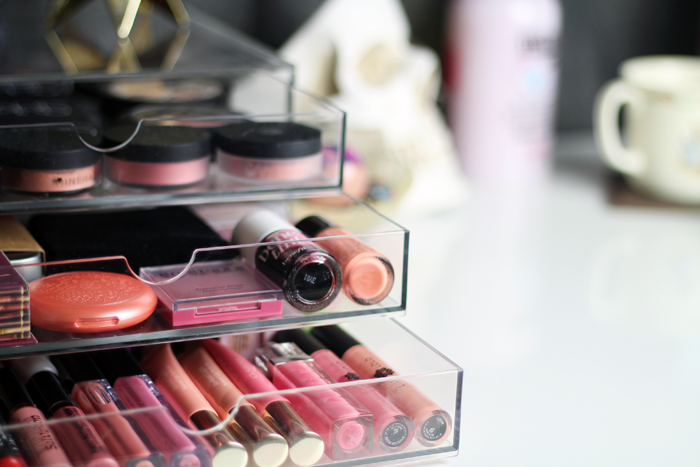 Ah, you can never go past some acrylic makeup storage! And I LOVE that goblet, I was actually going to comment about how much I liked it before I finished reading your post and realised that it's also Harry related and now I love it even more!!! I love your desk it looks so pretty, I wish mine looked this tidy! There really is nothing better than having a move around with furniture, a change can definitely be a good thing! I love that gold star! I really need to have a revamp of my desk, it's so boring but cluttered! My desk is no where near as lovely as yours! Your mug is too cute. I too am allergic to ironing! - Tom gets very annoyed at me about this my to iron pile is always huge! I wish I had a desk. I just sit on the sofa or my bed to blog. I feel i'd probably be more productive with a desk! 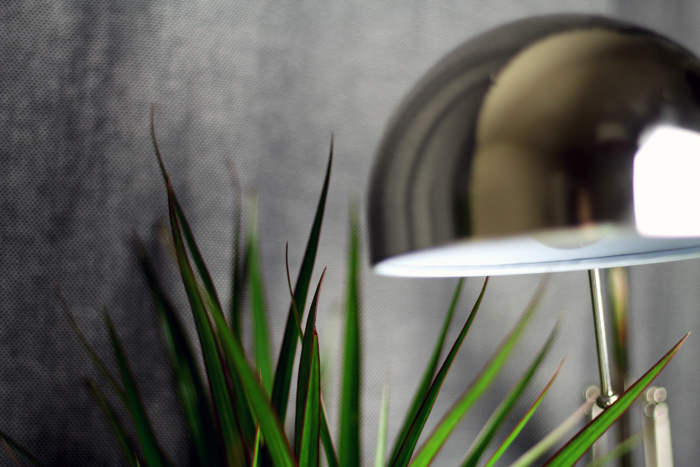 I've been looking for a lamp like that for ages, hoorah! 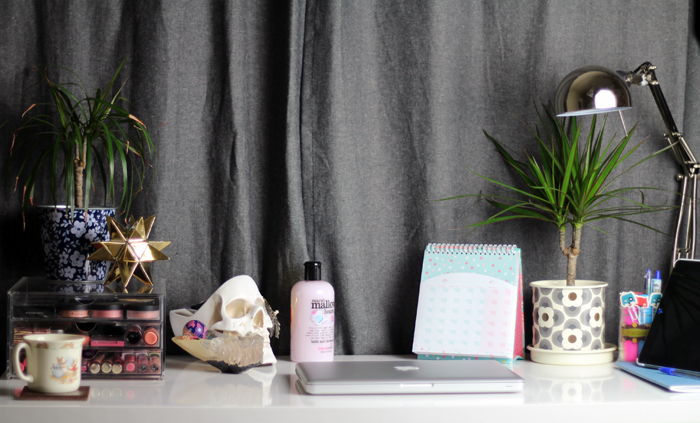 Seriously, your desk is absolutely stunning and those grey curtains are gorgeous. I need that skull tidy thingy!! JaynieShannon | Beauty, Lifestyle & Health. (I follow back). Ha soft furnishings are definitely a sign of adulthood, I love it!